I wanted to take a minute to highlight our capabilities and what the possibilities are with HDU signage. 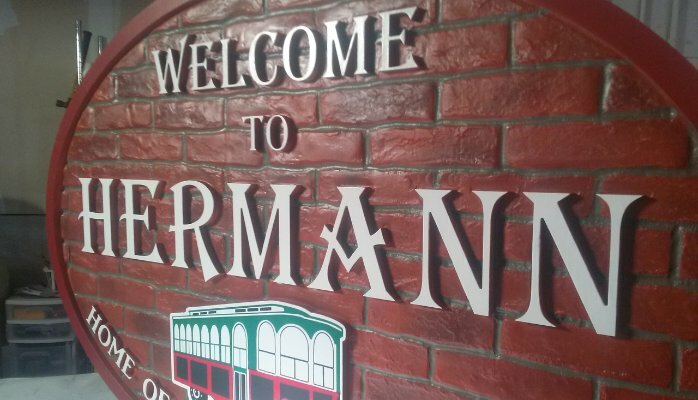 We were asked by Larry Hagedorn from Hagedorn signs in Hermann MO to create a sign that represented the history of the town and showcased their infamous trolley. Larry provided us with the basic design and several pictures of brick from around town to get a feel for the style of old brick that they wanted the sign to have. We created a 3D routing file from the photos and let our 5′ x 10′ CNC router make the initial dimension of the sign. We finished up the brick with hand carving to put the finishing touches on the dimension. After priming the material, we custom painted the brick with a realistic look to match the towns buildings. Baker Sign Group exclusively uses DUNA – corofoam ( http://www.dunagroup.com/usa/products/foams/corafoam-high-density) for all of our projects. We have worked with every HDU product that is on the market extensively and there is nothing that compares in the quality and consistency of DUNA. For this project we used 15# material and added a 6mm aluminum composite backer for extra strength. We also supplied Larry with the steel posts painted and ready for installation. We take great care in the detail and craftsmanship of our signs and we think it shows in the final product, a sign that will hold up for years!